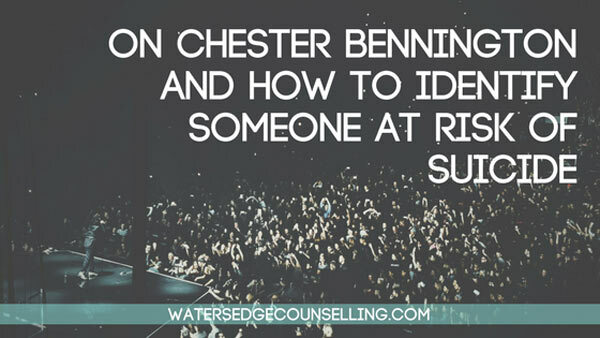 When news broke that Linkin Park singer Chester Bennington died by suicide last week, tributes to the iconic singer poured out online. And whether we lose someone who is beloved on a global scale, or a member of our community, the ripple effects of such a tragic event often lead to questions like “What could I have done?” and “How could I identify the signs they were struggling”? In light of this, we wanted to share a previous blog with you, giving you five questions to ask someone you believe may be at risk of suicide. We hope this equips you to help your family and friends if you are concerned for their safety. It can be scary to ask a loved one if they are at risk of suicide. There is a stigma within society that insists asking someone about suicide attempts, thoughts or plans will perpetuate the act of suicide—but this is simply not true. In fact, asking someone if they are struggling, and giving them the opportunity to share their pain with you, can actually alleviate the risk of the behaviour occurring. If a friend or loved one has been acting uncharacteristically, either withdrawing from people or acting irrationally and stepping out in risk-taking behaviour, then you may need to ask them if they have thought about suicide. Other indicators they are thinking about it are unexplained injuries, death or self-harm related content being posted on their social media, increased substance abuse, previous suicidal thoughts or attempts and a sense of hopelessness. Here are five questions that will help you assess the risk of a loved one carrying out the act of suicide. The presence of suicidal thoughts doesn’t mean a person will act on them—but it is still essential you know they are there. Suicidal thoughts will often perpetuate and can become more vivid as a person feels a greater sense of hopelessness. Asking them this question doesn’t imply they want to suicide. Actually, finding out when the thoughts began and how prevalent they may be allows you to understand the weight of what your friend is experiencing. Asking a loved one if they have a plan in place to carry out the act of suicide is essential. If they do have a plan to suicide, either a carefully constructed and well thought out plan, or a fleeting idea of what it would look like, you know they are high risk and immediate action needs to be taken to care for their wellbeing. A person who has a set time and place for the act of suicide, and who has begun putting their affairs in order (writing letters, cancelling registrations etc.) is at extremely high risk of carrying out the act of suicide. Do you have access to any weapons or means of suicide? A person who has already acquired a weapon or means of suicide is at serious risk. Other people who know weapons or tools are available in their work place or at a friends or relatives place are also in danger. If your loved one has access to a weapon, ask them how regularly this occurs, if they have considered how they would access it and the likelihood of this. Understanding if your loved one has struggled with suicidal thoughts in the past will help you to support them and keep them alive. Ask if they have attempted suicide in the past, or thought about it. See if they have previously harmed themselves, and if they’ve created a suicide plan in the past. If this has occurred in the past, the risk for your loved one increases, but this does not mean they won’t be open to help. Why have you chosen to stay alive? Up to this point, your loved one has made the decision to stay alive. Irrespective of their struggles, they have chosen to remain. When people have suicidal thoughts, they resist them for any number of reasons: their love for family and friends, obligations, fear, the hope that things will change. Take this reason and run with it. If a person is afraid of dying, they don’t want to die—they are likely exhausted and don’t know how to fight anymore. If family or friends is their motivation, remind them of the profound love they experience and the future events and moments they want to witness. If obligations are keeping someone alive, ask them what these mean and how they affect the people near them. If a loved one answers yes to one or more of these questions, they need further help. Please call 000 or 911 in an emergency. If they are experiencing thoughts of suicide, or you are concerned for their wellbeing, call Lifeline on 13 11 14. For crisis hotlines in other countries, visit Hope Movement’s International database here. Your G.P. and/or a Professional Counsellor can give you the additional support you need. For a FREE 10 minute consultation as to how we can help you, ring Colleen on 0434 337 245 or Duncan on 0434 331 243 or you can book an appointment press Book Now to book in our online diary.